A cleanup operation must not adversely affect the health of those carrying it out. 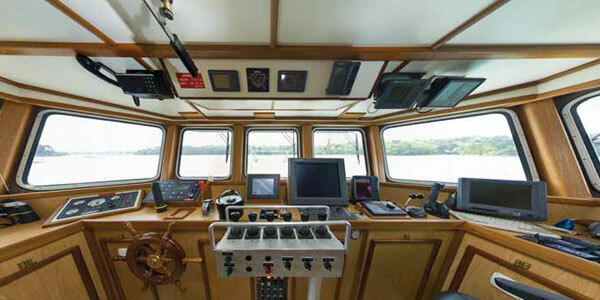 Very few vessels are fi tted with a specific safety and protection system for the personnel. The people on board are required to conduct many exterior activities, with no guarantee that their safety will be protected. Personnel are not required to carry out any exterior operations, other than to deploy the transfer hoses. The living quarters and wheelhouse are protected and pressurized, so that the safety of the crew on board is guaranteed when working in polluted areas. Bureau Veritas classification : Category 1 and Oil Recovery Ship.